I am building a new boom for a marconi mainsail on a 38' ketch. How would you set up the reefing hardware? The boom is box section fir. I could also do something like this setup, which would save me having to cast custom bronze eyes and blocks. I think I could package it all in a mortise at the aft end. I've never used this setup, does it have enough power in the right direction? Net pull is forty five degrees when fully pulled in. Presumably the reefing clew line will fit that nice eye. Many like the reefing clew line on both sides of the sail, as pictured. I prefer both parts to come up on one side allowing a cleaner bunt. Once pulling on the line, it stays off the leech. I don't get that "wrong!" , it looks exactly the same as the graphic. Edit .. Oh I see, direction of the loop. I still have cheekblocks. I rig it so the reefed bunt of the sail doesn't get crushed by the reef line, seen mangled sails after one sail. Last edited by John B; 04-05-2019 at 03:32 PM. I don't get that "wrong!" , it looks exactly the same as the graphic. I think its referencing which way the "choker" loop is oriented. Sorry about the giant pics. Do you have a dead end on the opposite side of the boom from the cheek blocks, or tie a loop on the same side like this? I think I like this method. I could just tie a loop around the boom behind the cheek block, the block keeping it from sliding forward. I won't be leading it back to the cockpit as shown. The diagramed "line only" arrangement is quite good. It can be fancied up a bit by using a small bullet block on a snap shackle that attaches to the reef clew cringle. That would eliminate the a multiplicity of reefing lines. Simple is always better. In most sized boats we encounter, I've found there really isn't a lot of need to run reefing lines through sheaves because when the halyard is slacked and the topping lift raises a boom a bit, there's really very little resistance to pulling the reef line clew aft. The reef slab will tighten up a lot when the halyard is pulled up (and/or the downhaul set up) and the topping lift is cast off. Are you running your reefing lines forward inside or outside the boom? Inside is nice to avoid loose loops taking off heads. You are advocating just one reef line that I shift between points as needed? It would save on hardware and line, but I think I'd rather not try to corral the end of the boom when conditions warrant a 2nd reef. I do worry about the swinging noose effect, but I was planning on running everything outside. With a wood boom, I don't want to have large openings into a chamber I can't maintain. Some fairleads should keep them from dangling too badly. Do you have a small winch to mount on the boom? Yes, there will be one bronze winch forward on the boom to handle the reefing line. I don't plan to have clutches (traditional boat) so I will have to release the first reef to winch up the second. 2 cleats, one for each line. I've used a line only approach enhanced with low friction sheaveless blocks. The line is run similar to the diagram above, but does the same thing at the tack as well. The blocks hang off the loops passing around the boom. So I have a single line running through both tack and clew. To reef, take an alpine butterfly in the reefing line towards the tack, haul tack down snug, take a bight in the part of the line towards the clew, pass bight through alpine butterfly, haul snug and secure with a few half hitches. Works well. Requires almost no hardware. A reef can be taken anywhere convenient along the length of your boom. In my case reefing is done from the hatch. My boat is tiny compared to the one in question, but it would cost nothing to try it. Oh, I also used small saddles on the boom where the reef line passes around it such that the clew is snugged down the reef line is held a bit outboard from the clew. The only suggestion I would have is that, before fastening any hardware to the boom, I would try some arrangement with lines-only to see what the proper combination of outhaul and downhaul tension you really need at the clew, notwithstanding the theory. I say this from a position of accumulated scar tissue acquired from setting up my new boat. It took me two weeks of sailing it every day on an expedition to figure out why the sail wasn't setting properly. Turned out in the end to be a non-intuitive combination of downhaul and outhaul. Now admittedly my sail is a lot smaller than yours, but with reefing done with a line-only set-up, you can fiddle with it for almost no cost until you get it right, and then, if it is warranted, invest in the hardware and put it where you know it needs to go. I find that most gaff and marconi sails don't need a winch to tension the foot. If reefing under way, bring the sail down to a little below the reef. Attack the outhaul first. Peak the boom up a tad with the topping lift and make fast the reefing clew line. Notice how this pulls the reefing tack cringle back a little. Key point. The reefing tack is then secured and you heave up on the halyard. The foot will tighten nicely. East the topping lift and off you go. Marmalade being a catboat, it was a bit of a hazard to go forward to the mast, so I led the halyards, all six reefing lines (three reefs, tack and clew each) and the 'LazyLift' lines to the cockpit. On Meg all will be at the base of the relevant mast. I find that the easiest way to handle the tack is just to have a single line spliced to the reef cringle. That way I can secure it before swaying on the halyard. For the tack, I was planning on having a line with one end made off on the mast below the gooseneck, it would go up through the cringle and down to a cleat on the opposite side of the mast. I was thinking the 2:1 advantage would be helpful. A single line would be simpler though. If I can get away without a winch for the clew, that would be great. It would make it much easier to handle multiple reefs. I'll try that before mounting the winch. I think I'm convinced to not attempt to use a sheave at the aft end of the boom, but will use a cheek block at the right place. Determining that right place might take some fiddling. all I've ever done is drop some halyard and clip the tack onto horns or a hook, a tack purchase is important if you're reefing from the cockpit but if you're forward at the mast then I don't really see the need. As for the cheekblocks, they need to be well aft of the cringle it's for, just like that first drawing. You have to really stretch the sail out and then put the cheekblock maybe a foot plus behind the cringle, which of course is where the vertical component of the reef line lands on the boom. I've seen reefed sails with more draft because of no outhaul or because of wrong geometry. They may as well have left full main up because they nearly had as much power through excessive draft as the full size but flatter sail had. I've always had or fitted a winch for reefing, maybe the sail size warrants it or I just like the fact you can go and tweak it...flatten that sail. 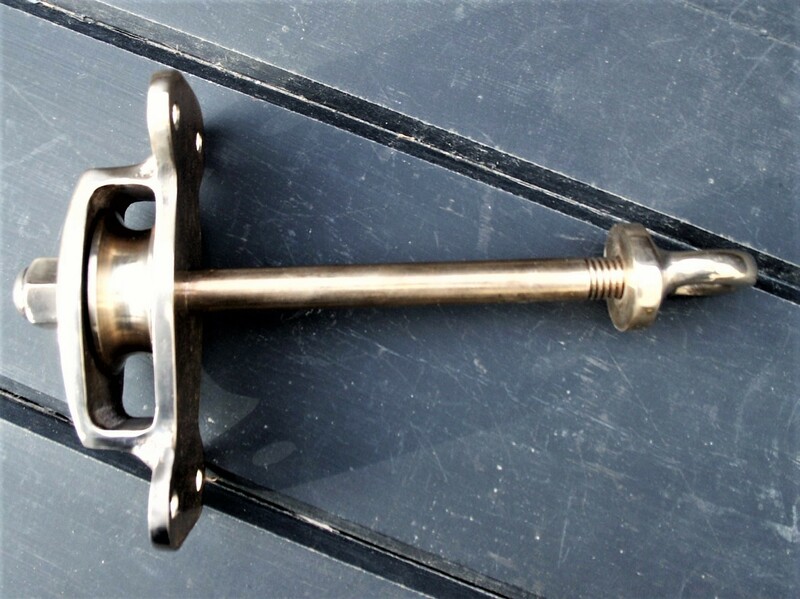 And thanks for the thread , it reminded me of the damaged cheek block I have, removed it yesterday and rummaged around until I found the HYE unit I had earmarked for the job. It goes on an ali boom so pretty easy to fit, I might cast it in position rather than cutting a curved base block. Last edited by John B; 04-06-2019 at 11:23 PM. The by pass reef line set up . Yes absolutely. That's what I was trying to refer to earlier. Rig like that traditional bee block setup and you not only do not get a tight foot but you end up with a crushed up sail and the resulting chafe damage.. one reefed sail and you're in for a trip to the sailmakers. That is the way I run the reefing line as well. I use a block on the side of the boom and a winch at the Fwd end of the boom that also serves the outhaul, and Cunningham. Horns on the gooseneck to drop the luff eyelets onto. It takes about 30 seconds for 2 crew to get it done standing at the mast. Reef in as we approach the bottom mark, and shake it out after rounding the top mark each time. Now, this is worth the price of admission! My reefed sail has always had that annoying, and inefficient, bunch up at the end. Hopefully this method will solve it. On my small boat, anything I can do to make reefing easier and safer is worth the effort. Yes, I learned something useful today. Wonderful. When I've finished my new deck, new sails is next on my lottery list, and converting from 1970s roller reefing to proper slab reefing. Knowing how to run the leech lines so as to get a decent reef and not ruin new sails is great. Last edited by Phil Y; 04-07-2019 at 02:48 PM. Ah, "By Pass". Now I have a name for what I was taught by Grandfather sixty years ago. I put the pad eye for the tail end a bit abaft and the same side as the cheek block. From the pad eye up to the clew cringle and through from the other side, thence straight to the cheek block. I make sure that the reefing lines and halyards are within easy reach. As I strike the sail, I haul in on the clew lines thus pulling the sail out allowing it to lie neatly in the LazyLifts. Last edited by Ian McColgin; 04-07-2019 at 03:41 PM. Pros and cons either way. Roller reefing allows infinite options for reefing, not just the two or three pre set slab reef positions, does not have all those reef lines and nettles flapping about the place, requires no further tidying up of the bunt once the reef is taken, and when she's all rolled away, is neater than a great pile of sail sitting atop the boom needing lots of lackies to hold it in place. 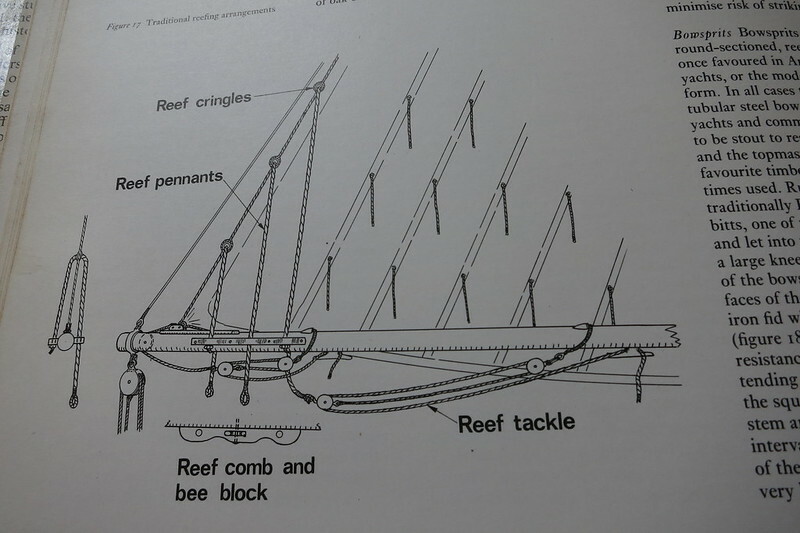 I can't say I've heard the by pass name or remember hearing it more like, but I was shown it 30 odd years ago when I stopped using the unmitigated disaster called roller reefing and converted to slab with a couple of cheekblocks, a hook and some reefing line. And a trip to the sailmakers for some cringles of course. Roller reefing can be made to work when the stars align and the topping lift is just so ,and by some miracle you actually get some foot tension. Good luck with that when it's snotting in hard and Neptune is trying to send you swimming. oh,and if you happen to be fit enough to crank a handle to wind 20 ft of sail off like a gym session, remembering that when you set it full next time you have to crank it 20 ft the other way too . The day I watched my 20 ft by 5 inch boom bend like a pretzel because of the ridiculous loadings a rolled sail imposes was the day I decided that crap had to go, and go it did tout suite. Last edited by John B; 04-08-2019 at 12:12 AM. I agree 100%. Roller reefing is garbage. Roller reefing works nicely on my paradox, but that is on an ultra small boat which might have something to do with it, or maybe that it is a lug sail. The only vertue I've sailed had roller reefing. Not a huge boat either I suppose at about 4.5 tons. Given that roller reefing isn't that common these days, perhaps that indicates many had similar experiences to yours. Whatever the case I agree that slab reefing is pretty much fool proof. Not trying to be pickly, but that is a outside/cowboy/lefthanded/Dutch bowline in the first post. Ditching roller reefing is the origin of this little project. Its also why I don't have any hardware to copy. The fitting is lovely, just rig it like the first drawing instead of using the eye. I was looking at mine yesterday but can't really give you any firm measurement because the reefed foot needs to be stretched out and taking whatever tack arrangement you have into account. Which is part of why I like horns or a locked off hook position. Nice spotting on the bow line! Having a look just now after replacing the 1st reef cheek block, it is 300mm behind the vertical, no tension on it. But the second is more like 500 to 600 behind, and that's because I put a much deeper second reef in the new sail, and I'm not shifting hardware.But it does demonstrate how adaptable the setup is. There are lots of reasons I'm moving away from it. First, the end boom sheeting is poorly located for my boat, putting a large compression force on the boom with the sheet only bearing on one cabin top beam. I'm switching to a sheet horse that will bear on 3 beams and sheet from directly above the horse. This required a boom that had greater bending stiffness and pretty much eliminates roller reefing. I also have purchased new sails, and had reef points built in from the start. They are loose footed, again not conducive to rolling. Because the existing booms are shaped to gently roll the sail, the CG is higher than the pivot point, so they have the infuriating habit of rolling over halfway through furling a sail and dumping it in a pile. I also did not feel that the hardware was strong enough so it needed to be upgraded anyway. The biggest reason though, is I want to be able to flatten the sail when the breeze is strong enough to warrant reefing, there is no control over that with roller reefing. So you are plenty happy with the 300 as well as the 600mm offset? That latter is pretty big. Maybe I'll shoot for 3-400 nominally and go from there. Without moving the cheek block, I can still alter the other leg easily if needed to change the net pull. I think 300 is bang on but doesn't allow much for error, like if you use a tack purchase and it hangs back a bit, or the sail stretched. If I was doing it again I'd test it on the boom by rigging an outhaul , sweating that and marking the reefed clew on the boom. Then I'd be confident. I agree with Anders, but why not have both options in the quiver. Nothing worse than having a reefed sail chock a block and with still too much shape for the conditions. Many times I've eased my reef to power it up when conditions do not warrant shaking it right out. My boats have either been masthead or gaff, so I don't play with mast bend except for static setup.